AKBN’s Executive Director, Mr Adrian Bylyku, together with a group of experts, on 11th of October 2018 made an inspection at the Shpiragu-4 oil Well, Berat, where operates Shell Upstream Albania B.V. 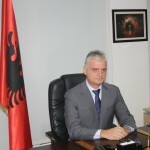 They were received by Mr. Rohan D’Souza, Director of the Company for Albania. During the inspection, the Operation’s General Manager of the well, Mr Andrew Young and Company’s engineers who were present at the drilling site, provided a detailed overview of the steps to be taken to finalize the assessment for Shpiragu-4 well. Among other things, the AKBN group headed by Mr Bylyku was informed of the mechanisms and equipment that will be used to extract hydrocarbons during the evaluation of Shpiragu-4 and the deposits where these hydrocarbons will be stored. The Shpiragu-4 assessment test will be carried out in two stages, a short-term evaluation test and then in view of the results to be obtained will be passed to the extended evaluation test. At the end of this inspection, Mr Bylyku expressed his appreciation for the Company’s work on Shpiragu-4 well and extended wishes to the Company for further success.